Both public and academic libraries are invested in the creation and distribution of information and digital content. They have morphed from keepers of content into content creators and curators, and seek best practices and efficient workflows with emerging publishing platforms and services. 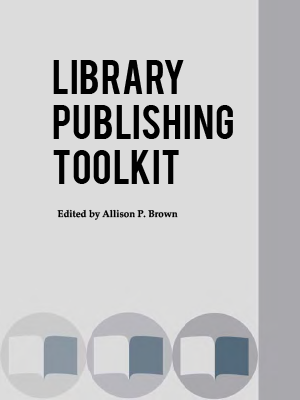 The Library Publishing Toolkit looks at the broad and varied landscape of library publishing through discussions, case studies, and shared resources. From supporting writers and authors in the public library setting to hosting open access journals and books, this collection examines opportunities for libraries to leverage their position and resources to create and provide access to content. Develop strategies libraries can use to identify types of publishing services and content that can be created and curated by libraries. Assess trends in digital content creation and publishing that can be useful in libraries and suggesting potential future projects. Identify efficient workflows for distributing content for free online and with potential for some cost-recovery in print on demand markets.